If you have seen the trend for ‘silent discos’ and fancy giving it a try, then why not try it in one of Europe’s most interesting spots? The View From the Shard is at the top Western Europe’s tallest building (unsurprisingly called The Shard), and offers panoramic views all over the city. While the idea of dancing in silence in such a place may seem a little surreal, it is certainly an experience, and unlike many events like this, everyone is made to feel welcome, not just people into a certain style of music! 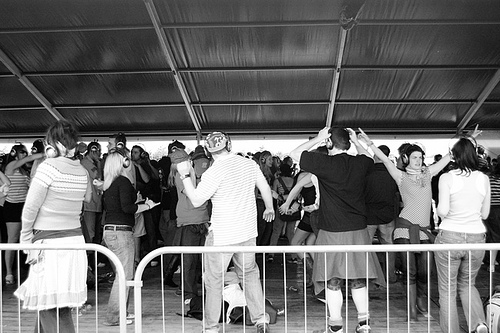 So What Exactly is a Silent Disco? The idea behind silent discos is that everybody listens to music on their personal devices and dances. It can look a little strange until you tune in and can hear the music, however the idea makes a lot of sense. It means that people with different tastes can listen to different Djs at the same time, in the same place, and that everyone can choose how loud they want their own music to be. If you like rock, played full volume but your friends all prefer laid back dance, you can now finally go out together dancing and have everybody happy! Another benefit is that if you want to have a conversation, you can take out your earphones and do it without shouting in each other’s ears like in a regular club. At the silent disco at The View From The Shard, there are always three DJs for you to choose from to tune into. The playlists they work with feature all different genres so whatever you are into, you should find some good stuff to dance to. The silent disco at the View From the Shard has become something of a permanent feature, having started earlier this year and with plans now for it to continue until at least February 2015. This means if you are in London anytime before that, you can go and check it out. There are several dates a month throughout November and December on Fridays and Saturdays, with the disco opening at 10pm and going on late into the night, allowing you to get great views of London when it is all lit up for Christmas! The price for entry to the disco is £37.50, which is not a small amount, but compared with a lot of other popular London clubs is not inexcusable! Despite the fact it hosts a disco, The Shard is an attraction for everybody, and that means the hours are different if you want to see the views and not go to the club – it opens at 10am, and closes at 7pm on Sunday to Wednesday, and 10pm Thursdays, Fridays and Saturdays. The nearest tube station to The Shard is London Bridge, and there are also regular buses to this area from all around central London,with it being such a major tourist area. When you leave, it is best to either check the night buses to where you need to get to, or get a black cab.